Join us at The Larson Farm to hear about Rich and Cynthia Larsons’ experiences with all grass fed dairy production. Established in 1977, The Larson Farm dairy herd is 100% grass fed, all A2A2 genetics, and is certified organic and also certified 100% grass fed by PCO. They sell grass fed beef, raw milk and also a line of pasteurized dairy products made on farm at the new creamery. 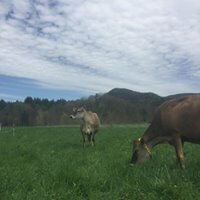 During this workshop you will learn about grass-fed dairy production, pasture management, fertility management and on-farm processing of high quality dairy products. Heather Darby, UVM Extension and Sarah Flack, Flack Consulting will join the Larsons in sharing their dairy farming system and experiences with you! This entry was posted on Thursday, September 13th, 2018 at 11:22 am and is filed under Uncategorized. You can follow any responses to this entry through the RSS 2.0 feed. You can leave a response, or trackback from your own site.